The family-favorite spaghetti and meatballs can contain a reasonable amount of calories for a meal if you watch your portion size. Fill your whole plate with this dish, however, and you may wind up getting more than half of your recommended calories for the day. Going overboard on the number of meatballs you add to your plate will also make the dish high in calories. 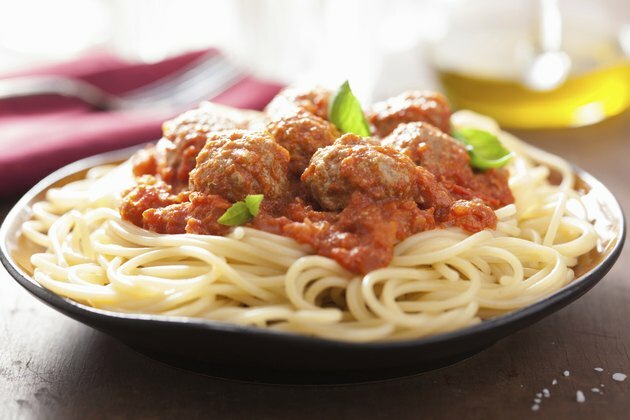 A plate of spaghetti and meatballs at a restaurant used to contain about 500 calories, but the same dish today weighs in at 1,025 calories due to increased portion sizes. A plateful of homemade pasta containing 1 1/2 cups of spaghetti with sauce and two meatballs made with a mix of regular beef, veal and pork can contain 1,060 calories. Using lean ground beef to make your meatballs will let you eat the same-sized portion for about 776 calories. Trading the beef in your meatballs for a mix of ground turkey and turkey sausage and adding just 1 1/4 cups of pasta to your plate can reduce the calories to 507 per serving. Your meal will only contain about 398 calories if you eat a one-half-cup serving of whole-grain pasta and two meatballs made with lean ground turkey. How Many Calories Does Beef Pho Have?